It’s important to remember we are exactly that, a Guide, to help you find the one that’s right for you. Whether fine dining, or benches on a beach, a casual meal at a restaurant overlooking the water or a kiosk with paper plates and a table to stand at, what is available varies greatly. But all are about seafood. You can easily access everything we have on offer from our Homepage. Because our main purpose is to help you find a Seafood Restaurant you will find front-and-centre on our Homepage our Restaurant Search Box where you can type in the name of the restaurant you are looking for, or a town or postcode (of your home or hotel for example), and you will be taken to a results page listing every seafood restaurant within a default setting of twenty five miles. You can choose to make an advanced search filtering for Price, Oyster Bars, Seafood Platters, Alfresco Dining, Seafood Kiosks/Cabins, Sea views, whether the restaurant has overnight Accommodation, Special Offers, Restaurant Events, and whether a table at that restaurant is bookable via our website. In the future you will be able to filter your advanced search by star rating. As diners review restaurants they will also be scoring their overall dining experience on a scale of one to five stars based generally on food quality, service, cleanliness, friendliness, atmosphere, value for money and whether they would go back; with five stars denoting excellence, four stars very good, three average, two poor and one bad. The star rating filtering option will come later because we are a brand new site and it will take time to accumulate enough reviews for star ratings to become statistically relevant. For example, a very good restaurant with only three reviews where one of their star ratings is bad will give an inaccurate impression of that restaurant. When you've made a restaurant search it will result in a list of restaurants that fit the criteria you have chosen. Each restaurant listing on this results page will provide a basic amount of information about the restaurant to help you make your choice, but if you click on a listing you will be taken through to that restaurant’s homepage on our site where you will find reviews, location on a map, average cost of a main meal, opening hours, and general but relevant information (such as whether some dishes must be ordered 24 to 48 hours in advance, whether children aren’t allowed in the restaurant in the evenings, whether bookings are required, etc). If provided by the restaurant there will also be Photo Galleries, Special Offers, Menus and more. We have provided several icons to make things easier. If an icon is lit up on a restaurant’s listing the restaurant has provided us with the related details. If it’s not lit up the information is not available. Restaurants with a Crab Icon next to their name on our results pages offer a greater array of larger shellfish (particularly items like lobster, crab, oysters, and langoustines) in addition to a very good choice of fish. In most cases these will be themed as seafood restaurant. We have given a Fish Icon to restaurants that focus on offering an excellent selection of fish along with a reasonable choice of shellfish (usually smaller shellfish such as mussels, king prawns and scallops). A few offer a greater array of shellfish like lobster or crab but not on a regular basis, or along with only a limited number of other fish or shellfish dishes. The Fish Icon restaurants may or may not be themed as seafood restaurants, but both categories willeasily satisfy any seafood lover. In the Black Box beneath the Fish and Crab Icons the distance to the restaurant from your central search point is provided in miles. This Icon represents small cabins/shacks/kiosks usually at the waterside, often with either no seating or limited outdoor seating, or with tables to stand at. Often these are Fishmongers who in addition to selling seafood to take home will cook it for you on the spot. Photo Gallery has been provided by restaurant. Oyster bars are sometimes an adjunct to a seafood restaurant, and sometimes stand alone. They focus, of course, on oysters, though some have other seafood on offer. These restaurants offer a large platter, often visually stunning, with a large variety of cracked shellfish and other seafood. Platters are usually for two to share and are often the most expensive item on the menu. Some restaurants require that you order Seafood Platters and lobster 24 to 48 hours in advance, so be sure to check the information section on the restaurant’s homepage to avoid disappointment. We make every effort to keep our information up-to-date, but please be aware that restaurants can change their policies at any time. These restaurants are situated with a scenic view looking over a stretch of water. This may be an ocean or beachside view, harbour or loch view, or a view over a river or lake. If you wish to sit outside at the water you must also look for the Alfresco Dining Icon for the availability of outdoor dining on your chosen restaurant’s listing on our results pages. This icon is given to restaurants with rooms available for overnight stay following your meal. This can be very convenient in more rural locations. A restaurant under this listing may have only two or three rooms available, while some restaurants listed on Seafood Lovers Restaurant Guide are situated within major city-centre hotels and will have a much larger choice. If the restaurant has agreed to provide us with details about this accommodation you can find it on their Seafood Lovers Restaurant Guide homepage. Menu has been provided by restaurant. These restaurants have current or upcoming Special Offers or Meal Deals available. This icon makes it easy to differentiate between Restaurant events and Seafood festivals in the Festival and Events results page. The restaurant event icon represents special events within individual restaurants, such as lobster or oyster-themed nights, or restaurants holding their own seafood festivals. On the results page for a seafood restaurant search we have used the Festival and Events icon as seen at the bottom of this page. In averaging a restaurant’s main meal price we’ve not included the cost of Seafood Platters and lobster dishes as they tend to be much higher than the other main meals and don’t allow a representative average cost. We’ve also omitted the lowest price main meal if it is significantly lower for the same reason. We’ve chosen to give you the average price of a main meal rather than a per person average cost of the full bill because only you know whether you intend to order a desert or an expensive or inexpensive bottle of wine, or no wine at all. You can generally expect that a starter is one half to two-thirds the cost of a main meal and a desert roughly half. You can then work out for yourself how much you’re willing to spend on drinks, giving you a more accurate idea of your total spend. Opening hours are a guideline only as many restaurants change their hours depending on the weather, season, and customer demand. We make every effort to keep these hours as up-to-date as possible. Clicking the Map button on a restaurant’s homepage will give you the restaurant’s location. Clicking Seafood Restaurants at the top of each page will take you to a search page for Seafood Restaurants who offer a good selection of fish and shellfish, or mainly fish. Enter the town or postcode desired and the results page will list all Seafood Restaurants within a twenty five mile radius that we know of. Clicking on a listed Seafood Restaurant will take you through to a landing page on our site dedicated to their restaurant with reviews, maps and other relevant information. Clicking Fishmongers at the top of each page will take you to a search page for Mongers who offer shellfish in addition to a good selection of premium fish. Enter the town or postcode desired and the results page will list all Fishmongers within a twenty five mile radius that we know of. Clicking on a listed Fishmonger will take you through to a landing page on our site dedicated to their shop with reviews, maps and other relevant information. Our Seafood to Your Door link at the top of each page will take you to a section listing a choice of companies offering an extensive selection of fish and shellfish shipped directly to your home in special containers to maintain freshness. Occasionally we list companies offering related items of a high quality, like fine wines, that our visitors may find of interest. Clicking Festivals and Events at the top right of each page will take you to a search page where you can type in an area, date or month, and a results page will then list relevant festivals and events throughout the UK, Ireland, the Isle of Man, the Channel Islands and Worldwide. Clicking on a listed Seafood Festival will take you through to a landing page on our site dedicated to the festival, maps and other relevant information. Individual restaurants’ events (if provided by the restaurant) can also be included in this section, and clicking on one will take you to that restaurant’s landing page on our website for more information about the event. Individual restaurant events can easily be identified amongst Seafood Festivals by their icon on the Festival & Events search page, which is shown above (under the heading Restaurant Events). The Newsletter link will take you to a brief registration form where you can sign up to receive our newsletter with seafood articles, featured restaurants, recipes, recommended cookbooks and more. 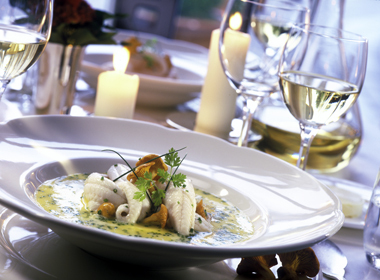 Visitors registered with Seafood Lovers Restaurant Guide are also able to participate in the Seafood Dinner Contest. We hope you enjoy the convenience Seafood Lovers Restaurant Guide offers, and thank you for using our site. If you find our website helpful, others will too. Please Tell a Friend.